We hope you've filed your taxes by now. The tax deadline is Monday, which can be a little stressful for some people who owe money or who have avoided the task. Either way, some restaurants and other companies feel your pain. That's why they're offering Tax Day specials, or, in some cases, freebies, to ease your woes. Read on for a full list of promotions, and remember: Many of these deals vary by location or they're listed as "while supplies last," so you'll want to call or maybe look up your local business on social media before rolling in and assuming you're good to go. (Also, we hope you have all these spots near where you live). Good luck out there! Boston Market: From Wednesday through Monday, anyone who dines in can buy a $10.40 Tax Day Meal Special, which includes a Half Chicken Individual Meal with two sides, cornbread and a regular fountain beverage at Boston Market’s more than 450 locations nationwide. And here’s another deal worth mentioning: Now through Monday, guests also can enjoy $10.40 off any catering order of $100 or more. Score! Bruegger’s Bagels: Want a Big Bagel Bundle for $10.40? With Bruegger’s annual deal, you can get 13 bagels and two tubs of cream cheeses for $10.40 -- a "deduction" of more than $3.50, from Wednesday through Monday at participating bakeries. To get this offer, you just need to be a member of the Bruegger’s Inner Circle. 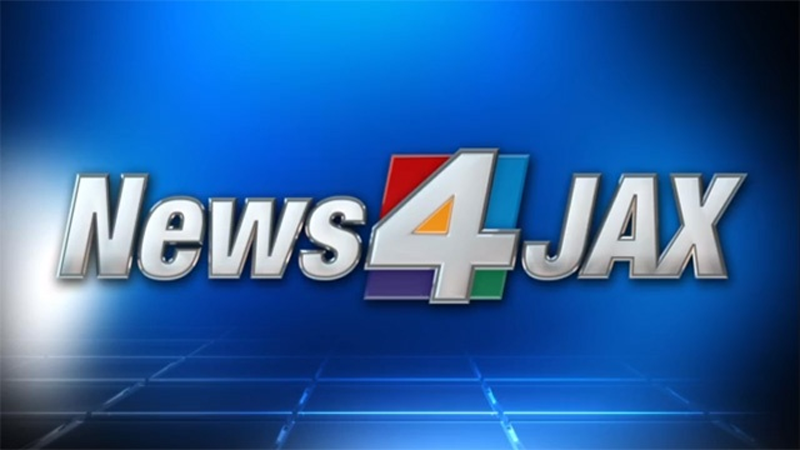 BurgerFi: The burger chain will mark Tax Day with $4.15 BurgerFi double cheeseburgers on Monday. There's a limit of one cheeseburger per person and just note that premium toppings will have an upcharge. People can take advantage of the offer when they download the BurgerFi app, as the deal is valid in the app only, and for in-store customers. 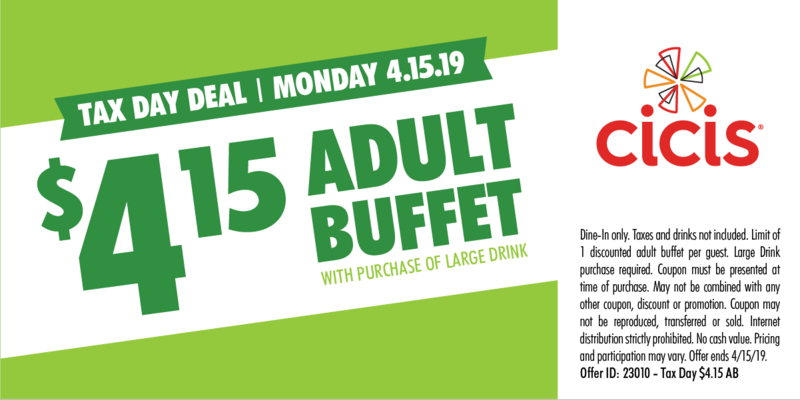 Cicis Pizza: Cicis' unlimited buffet will cost you $4.15 on Monday, April 15 -- get it? -- if you buy a large drink. Present this coupon to redeem the deal. 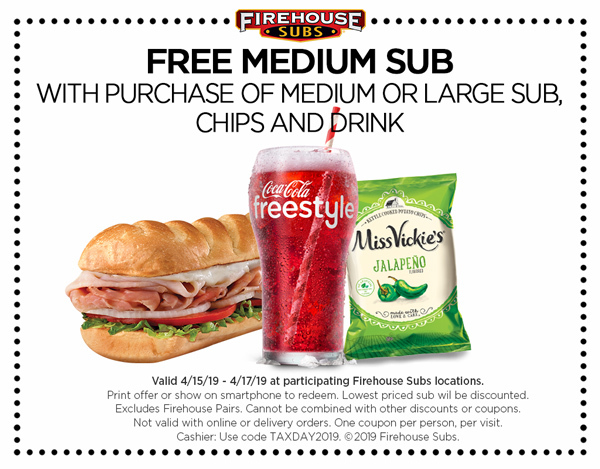 Firehouse Subs: From Monday to Wednesday, you can snag a free medium sub if you buy a medium or a large sub, chips and a drink. Here's the coupon you'll need to show at the register. 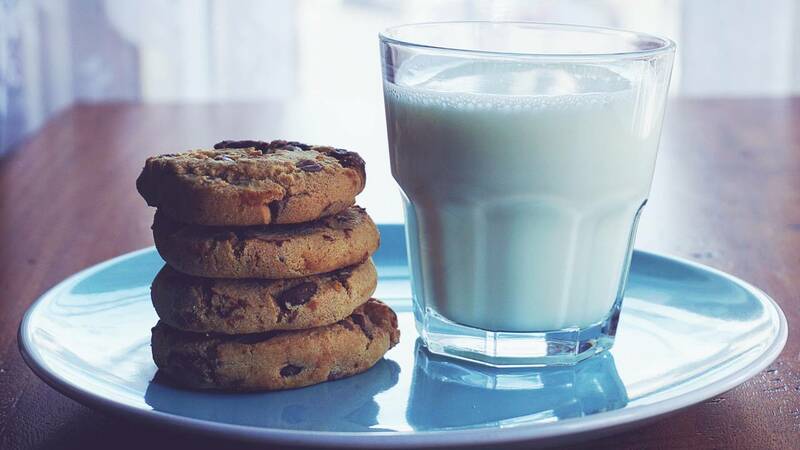 Great American Cookies: The chain is offering one free original chocolate chip cookie to customers who stop by participating stores on Monday. You don't have to prove that you filed your taxes; just come on by! This is valid at U.S. stores only, while supplies last, limit one per customer. Hardee's: You can get a free sausage biscuit from 7 to 10 a.m. Monday if you say the secret words “made from scratch,” while supplies last, limit one per customer. Hot Dog on a Stick: Go enjoy one free original turkey or veggie dog on Monday. No purchase or proof of completed taxes is necessary, the company said online. Kona Ice: "No taxation without relaxation," the website says. This deal seems to vary a bit by location, but it seems as though you can stop by the company’s island-inspired trucks Monday for a free cup of tropical shaved ice. Find participating hours and locations here. Noodles & Company. : Take $4 off any online order of at least $10 if you’re a rewards program member. Office Depot and OfficeMax: Well, this one makes sense, doesn't it? "Purge the paper, clear the clutter and protect your privacy this tax season with free Workonomy™ shredding services at all Office Depot and OfficeMax stores," the company said. This deal actually went into effect March 31, and it runs through April 27. Customers can bring in up to 5 pounds of documents to shred, free of charge. You must present this coupon. Planet Fitness: Members and nonmembers can use available HydroMassage chairs with a coupon that's expected to be available online. This promotion runs from April 11-20. Potbelly Sandwich Shop: On Monday, Potbelly will offer a buy-one, get-one deal on sandwiches of equal or lesser value -- all day. To redeem, Perks members can use their Potbelly Perks account and non-Perks members can simply tell the cashier at checkout that it's Tax Day. Schlotzsky's: Shops will offer guests one free small "The Original" sandwich with the purchase of a medium-sized drink and chips. Smoothie King: Take $2 off any 20-ounce smoothie from Monday through Thursday with Smoothie King's Healthy Rewards app. Sonny’s BBQ: The BBQ joint is serving up a deal for Monday only that offers guests 50% off Sonny’s Sweet and Smokey or House Dry-Rubbed St. Louis Rib dinners, which include two sidekicks and bread. This special is available at all 100 of Sonny’s BBQ U.S. locations. TooJay’s Deli: Snag a burger and beverage combo for $10.40 when you show this coupon. White Castle: You can get 15% off any order with this coupon. The deal is for Monday only, and it's not valid with any other discounts, specials or offers. Online orders and delivery are also excluded. One coupon per customer per visit and this is for participating White Castles only.